A kolam at the threshold, the intricately carved 'Granny Door' leading into the restaurant are the first indications that something is different. The lights are low, bringing the gleam of copper and stainless steel vessels into focus. And the unmistakable aroma and sizzle of dosas and appams. During the day, The Dining Room at Park Hyatt Chennai is as contemporary as any other discreetly busy five star restaurant. At dusk, it changes, chameleon-like, into Beyond Madras, the ethnic southern Indian inspired dining space. Waiters are dressed in the traditional attire of the region, tables are laid with shiny silverware and baranis - ceramic pickle jars, terracotta coloured napkins sit on white tablecloths and Indian music complete the setting. Make no mistake - it's very much a five star setting. 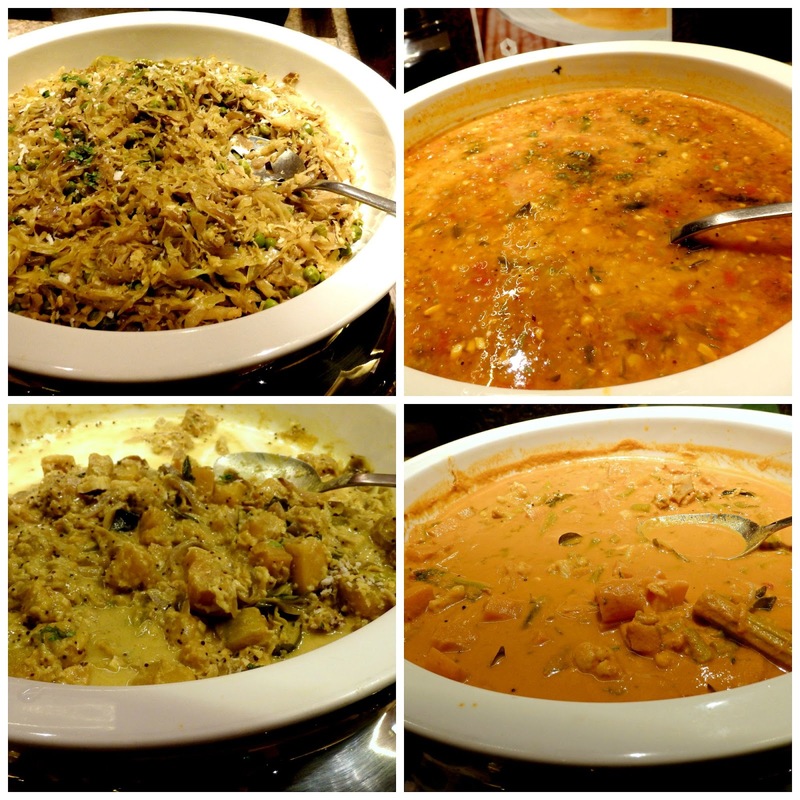 We knew Beyond Madras was being readied and we were thrilled to be invited to review the new offerings. 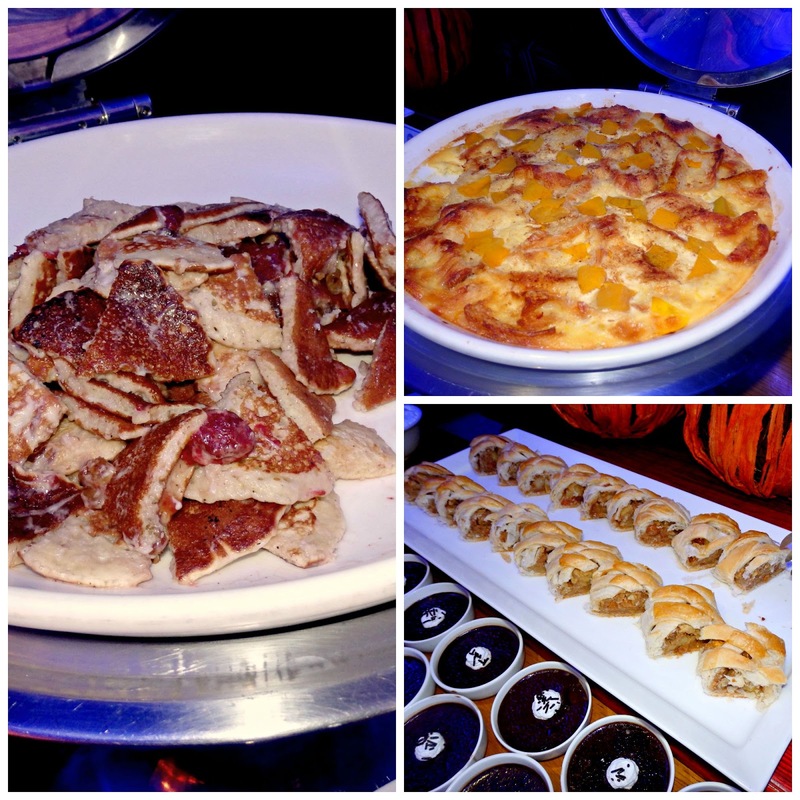 Once seated on plush sofas, menus are handed around, it's a buffet with table service. The menu is changed on a rotational basis. Chef Balaji and his team have spent time learning the finer nuances of classic south Tamilnadu food from the region's best teachers - a whole generation of older women - paatis, who have been making this cuisine for most of their lives. The traditional ways of cooking, right up to the hand pounding of spices and pastes are faithfully followed, we were told. All the niceties were observed - cold towels to refresh ourselves and a choice of sherbets offered. I chose nannari, Indian sarsaparilla. 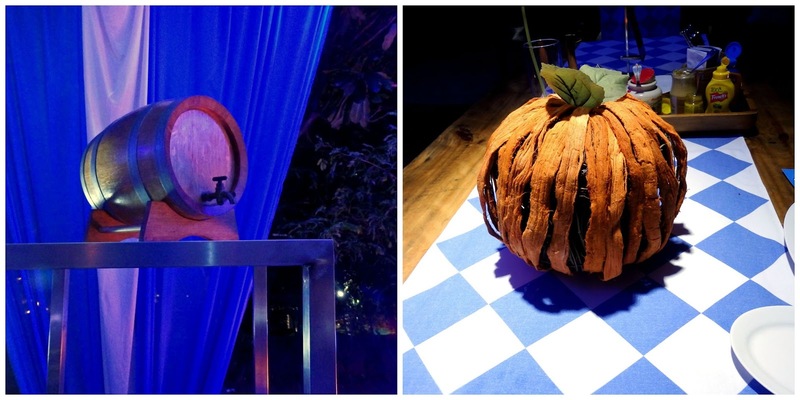 The drinks were brought on a wooden tray with slats. One sip of mine and I was transported to my days at hostel, sneaking out with my roommate on hot Saturday afternoons to the nearby juice shop for a glass of nannari sherbet. We'd watch the owner pour the thick syrup from a bottle into glasses, add a squeeze of lime juice and top it up with water and ice bits - weren't we bold? I still think it's one of the most refreshing of drinks. Of course there is no need to play Russian Roulette with Park Hyatt's offering and believe me, it was the old familiar taste again. Only this one had sabja (sweet basil) seeds in it. A basket of bread made its appearance, the bread, shaped into buns was topped with spices and crushed peanuts and had a tangy tomato chutney as accompaniment, a match made in heaven. Spices used in cuisines south of Madras are mainly coriander, chillies and fennel, along with ginger, garlic and shallots. Millets are also used extensively. One of our starters was ragi wadai - finger millet patties and sola pinju varuval - fried babycorn. While babycorn is not native to the region, the clever use of spices and rice flour that coated the corn resulted in a crisp texture. The wadai could have done with more pronounced spice notes. Neither of the starters had any trace of oil on it. 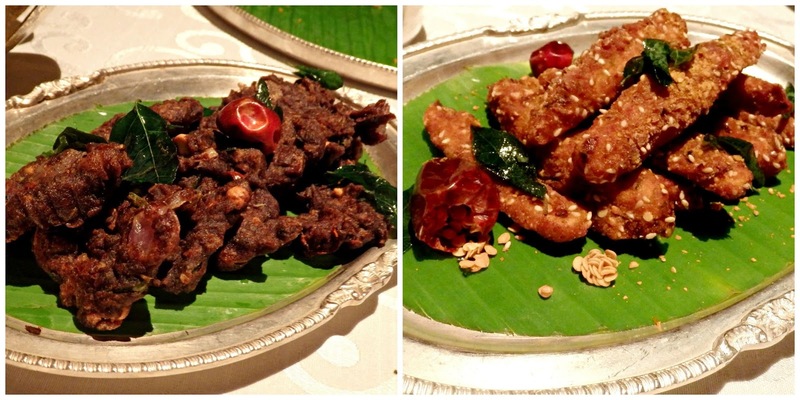 The non veg starter was kothamalli kozhi - chicken cubes braised with chillies and coriander. The meat was very tender and the coriander gave the dish a wonderful fresh aroma. The food was served on washed banana leaves that sat snug in our large plates. Three veg curries and 2 non veg ones were served in little katoris or bowls. There was a mixed veg curry thickened with coconut and peanuts, a green pea curry and a deliciously tangy vendakai (okra) curry. 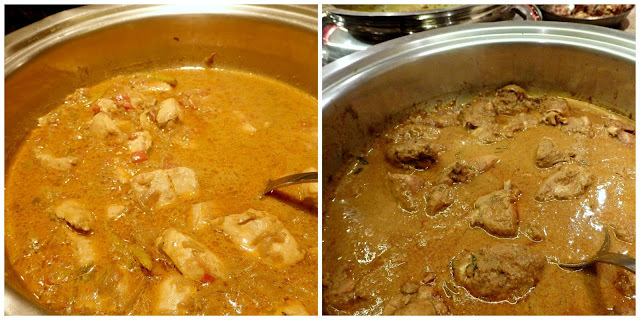 Non veg gravies included a dark red snapper curry that had been cooked in a clay pot(again tangy but not spicy), a mild white chicken curry thickened with cashew paste and a home-style mutton curry. 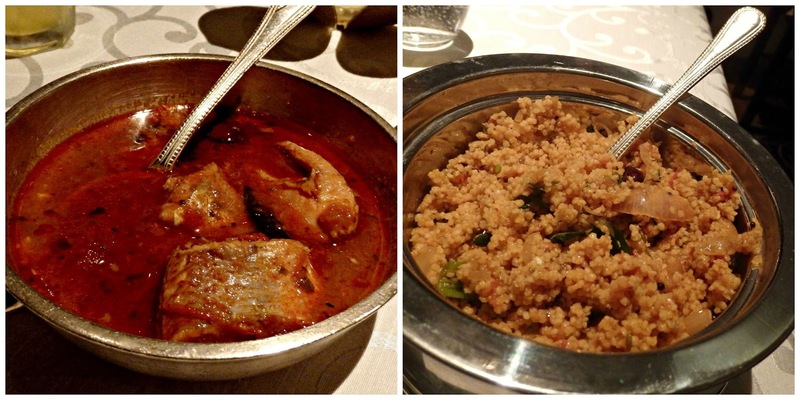 They were served with a flaky parota and batter-based breads like pearl millet dosa, idiyappam and a lacy appam. While the curries were tasty, I wish the flavours were bolder. Most Indian meals include a serving of rice, but here, it had been replaced by a more healthy thinai thakkali sadam - foxtail millet cooked with shallots and tomatoes. Interestingly, millets are used extensively in the southern regions of the state. Dessert had been pre-plated, there was a serving of elaneer payasam - tender coconut cooked in coconut milk, inippu sevai - rice vermicelli with grated coconut and sweetened with sugar, an elegant slice of vatallappam - steamed caramel custard and Beyond Madras' signature filter coffee ice cream with a dainty crisp wafer. The hero of the plate was definitely the vatallappam with its silky smooth texture and beautiful coconut custard flavour. Nope, they were not done with us as yet and as we were told in the beginning, our meal would end with a hot beverage. The choice was between a cup of traditional filter coffee and kalkandu pal - hot milk sweetened with palm sugar. I found the milk far too sweet so if you order it, it might be a good idea to ask for a less sweetened version. Like the end of all good South Indian meals, the mandatory betel leaves were brought out, along with lime paste and other paraphernalia. The meal at Beyond Madras is priced at 1350/++. As Restaurant Week Chennai is going on, the whole menu is available for 900/++. Service is very good and every aspect of the meal is explained. And don't forget to take a string of jasmine flowers as you leave the restaurant. Sussegado means "take it easy"; where better to sussegado than in Goa. But guess what - Goa has come to Chennai, to Spice Haat, Hyatt Regency Chennai to be more specific. 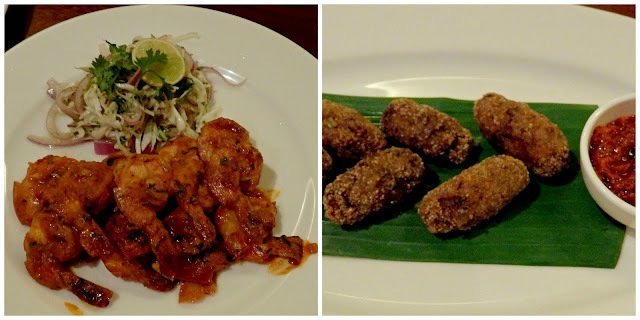 My friend and I were at the bustling Hyatt restaurant to review their ongoing 'Sussegado - Just like Goa' food fest. I've never been to Goa but most people go there for the sea, sun, feni and food. The first two I have plenty of at my doorstep, the third I get from friends returning from a Goan holiday, but Goan food, I'm told, is a different kettle of fish. For a while, I debated if I should go for the meal with a boxful of tissues. That's what I've heard of the spice levels of Goan food. Chef Edridge Vaz from Park Hyatt Goa Resort and Spa has curated a wonderful menu that represents the flavours and colours of Goa on a plate. Twelve Goan specials every day and it's a different menu every day. And there was no need for the tissues as he's used Kashmiri chillies so there is plenty of colour and tolerable heat. 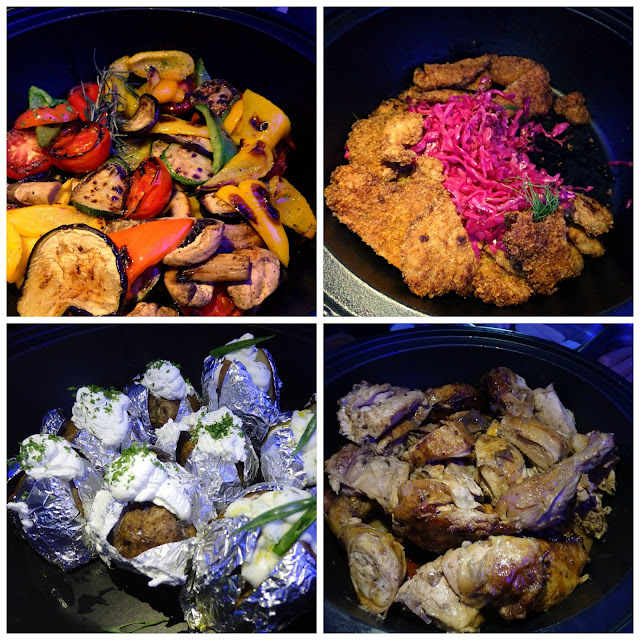 We started with mushroom peri peri - mushrooms cooked in vinegar and peri peri chillies, chicken jeri meri (don't you love the rhymes? ), prawn peri peri and semolina crusted lamb croquettes that were served at the table. Our favourite was the lamb. The crisp crust was the perfect foil for the tender lamb mince. Jeri meri was boneless chicken with a coat of jeera and pepper. It was a seamless combination, neither spice overwhelmed and the chicken was sooo tender! My most favourite was the prawn peri peri, loved that it tasted like a well made sambal though the prawns were a bit overcooked. Chef Vaz took us around the buffet counters, explaining the ingredients and method of cooking. Goan food has a lot of Portuguese influence, hence the peri peri chillies, some amount of influence from Mozambique and even from faraway Brazil! A bit of a surprise when we learnt that coconut is used extensively in Goan cooking. So definitely there was fish guisado (regarded as Goan comfort food), chicken xacuti and an amazing prawn and okra caldin. The flavour of the prawns had permeated the okra and the coconut milk was similarly flavoured. The best accompaniment for the caldin is rice. The vegetarian menu too looked interesting and we loved the pumpkin mergol, cooked in coconut milk, tarkarachem hoomand, a mixed veg curry with coconut milk and drumsticks, cabbage foogath and dal ros - lentils cooked in coconut milk. Another surprise was when we learnt that Goan food is served with red parboiled rice (there's white rice too). My only grouse was that the seafood was overcooked, I guess it's a problem when serving seafood at a buffet. So where was the vindaloo? Since we asked for it, we got it. Tender cubes of pork in fiery red gravy and the piquancy of the toddy vinegar gave the whole dish a wonderful zing. And no, it wasn't super spicy, just a pleasant heat and perfectly seasoned. 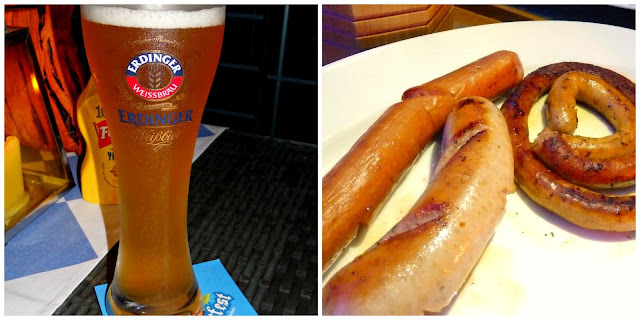 Isn't Goa known for Goan sausages? What we got was feijoada, cubes of pork, beef and navy beans cooked in a gravy that tasted like a stewed version of a Goan sausage. It was delicious. Again, it looked super hot, wasn't and tasted fabulous. Dessert was mangane - lentils, sago and coconut pudding served with jaggery. 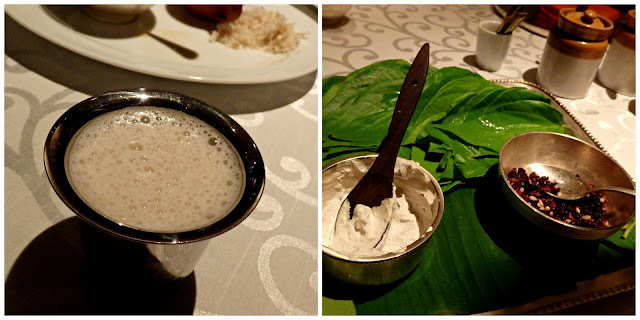 It was like an almost set version of a payasam and it was delicious. There was also bebinca, truly a labour of love. Cake batter made of egg yolk, coconut milk and sugar is baked layer by layer. The resultant cake is soft and flavourful. We also had doce, a sweet made from gram, jaggery and coconut. It was light and the bits of coconut provided a crunchy texture. Well, that was great food, and chatting with the chef, he told us he was taught to cook by his mother. That explained it - all that we ate sat light in our tummies and it was like having a home cooked meal. I'm so inspired to go book a ticket to Goa. And sit under a palm tree on a Goan beach - looks like it will happen. Catch Sussegado - Just like Goa at Spice Haat, Hyatt Regency Chennai on till 14th September. 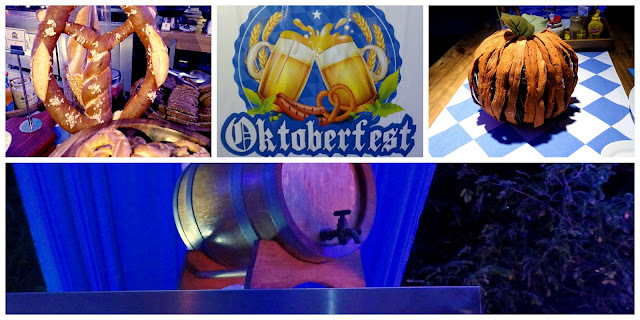 Call +91 44 61001234 for reservations. Watermelon and feta salad for starters. Pretty passé you say? Vibrant greens arranged on an artsy white spoon and two watermelon pink shimmery globs with a cube of feta in the middle of each. 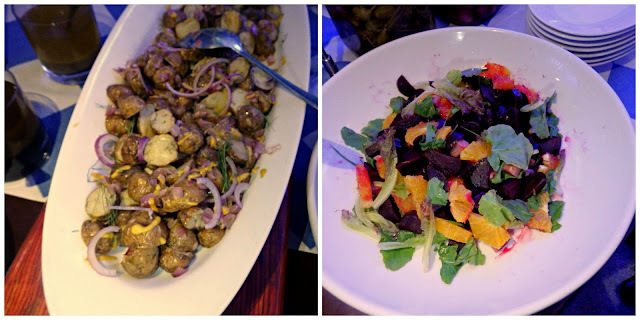 With a flourish, the Watermelon Ande with Desi Herb Salad Herb Salad was presented. FoodFood Maha Challenge winner Saransh Goila and Style Chef Shailendra were in Chennai to show a group of us some molecular gastronomy. In addition, Chef Saransh was going to launch his new book “India on My Platter”. The setting was the uber chic Design Hotel at Phoenix Market City where a lift whisked us up to the 3rd floor. Walking into the improvised cooking studio, my eyes were drawn to the beautiful light fixtures on the ceiling. At first glance, they looked like a series of lanterns and then realisation dawned that they were representative of Indian musical instruments. It’s said when the culinary arts and food collide, molecular gastronomy is the result. Molecular gastronomy is all about food textures. Also known as experimental cuisine, we were going to be shown 3 techniques – caviar, air and foam. What was interesting was that these techniques were going to be used in the making of a 4 course meal - a South Indian thali, comprising of an appetiser, salad, main course and dessert. Very molecular, very Indian! The chefs got down to chopping dark chocolate and cocoa butter. Quickly melted in a double boiler, the mix was cooled to room temperature and then mixed with soy lecithin and whipped. The technique of airing gave the chocolate a light texture. It was poured into silicon pots and left to set. While that was going on, a whole lot of beetroot cubes, ginger, garlic, coriander leaves, ice and coconut milk was blended into juice. The juice was then strained into shot glasses amidst oohs and aahs from the very appreciative audience who admired the almost fuschia colour. More coconut milk was transformed into foam with a whipper and layered over the pink juice and over it, coriander leaf air. Samples were sent around for us to taste. It was a beautiful amalgamation of flavours. The unusual marriage of ginger, beet and coconut was perfect, the sharpness and heat of the ginger mellowed by the sweetness of coconut milk. The inspiration for this was sol kadi, a kokum based digestive. 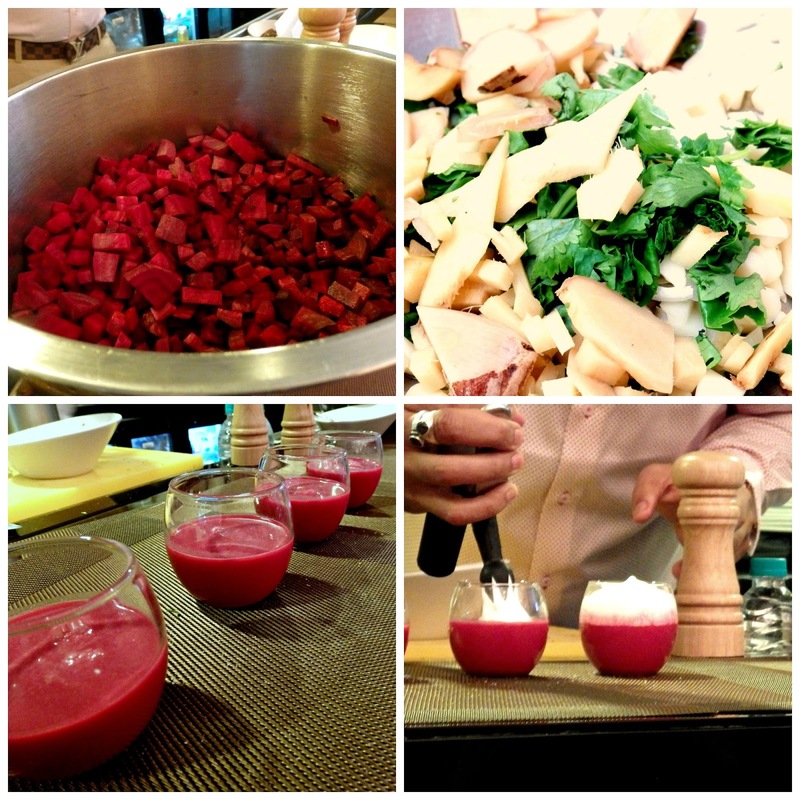 This then was Beetroot Sol Kadi, the appetiser of the evening. The chefs got to work roasting condiments and spices to make a Madras curry powder mix. 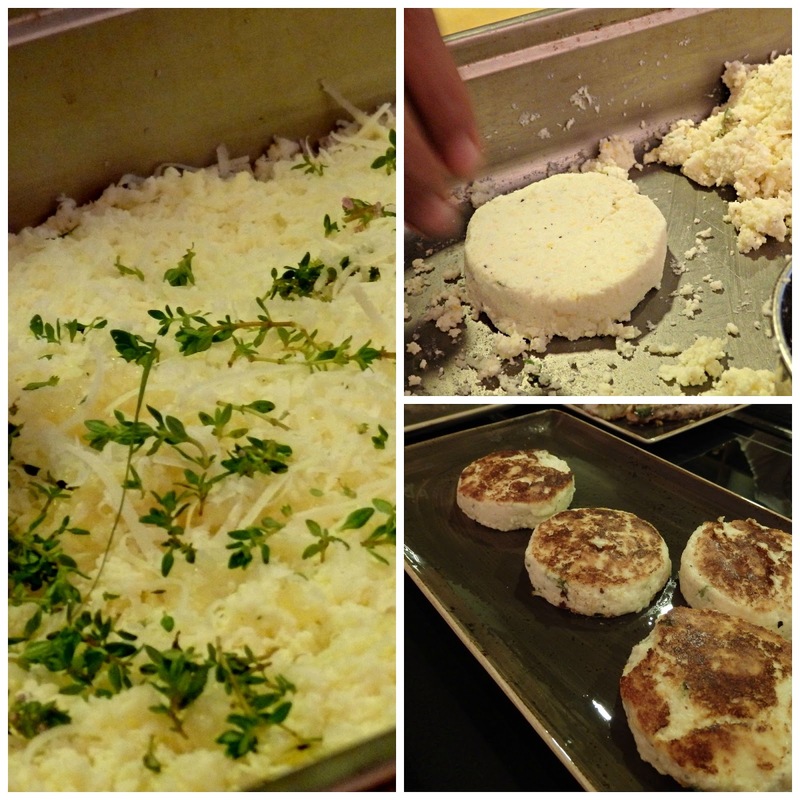 They grated paneer and Parmesan cheese and mixed it with fresh thyme and orange zest and shaped them into patties. 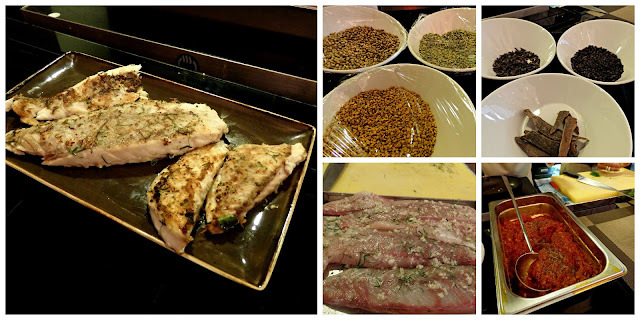 For the non-vegetarians, a chiffonade of curry leaves, salt, pepper and chopped garlic were sprinkled over fresh fillets of sea bass and dispatched to the kitchen to be fried. While the foaming and airing and marinating were going on, Chef Saransh kept throwing culinary questions at us and correct answers were rewarded with the promise of an autographed copy of his book. 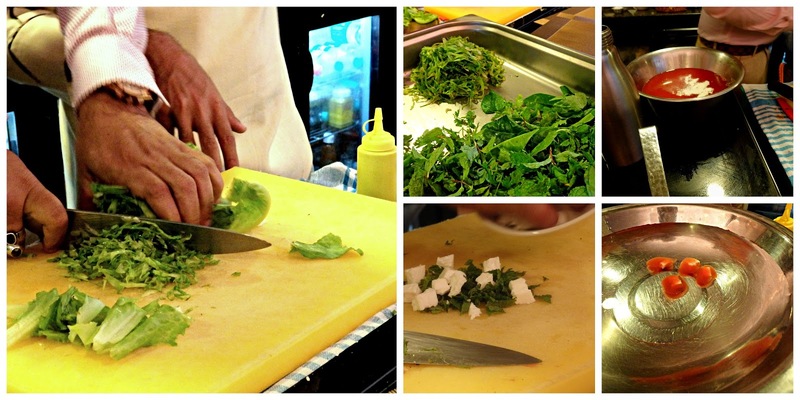 Chef Shailander was busy making a chiffonade of romaine lettuce. His wickedly sharp knife was a blur of motion on the chopping board and soon, the lettuce was reduced to a pile of thin strips. Mint, fenugreek, baby spinach and coriander leaves were tossed with French dressing and the desi herb salad was ready for the watermelon caviar. A tomato concasse was made and into it, some of the Madras curry powder was mixed and the resultant aroma was absolutely tantalizing. It was put into a whipper and converted into foam. The plating was again simple – the cottage cheese patty sitting on the tomato foam. Both the fish and the cottage cheese patties had minimal seasoning but the tomato foam with its South Indian flavours lifted both fish and cheese to sublimity. How many chefs does it take to work a whipper? No South Indian meal is complete without paan. Going back to the Chocolate Gulkand Air, a vibrant green betel leaf was placed on a white plate. A pot of chocolate was unmoulded and placed on the leaf. Biscuit crumb “soil” was sprinkled over and a tiny sprig of mint was planted in it. A line of soil decorated the plate, a chiffonade of betel leaf and strands of gulkand finished the look with dots of rooh afza. The chocolate had set beautifully and it was an airy dessert though I think a better brand of chocolate would not have gone amiss. 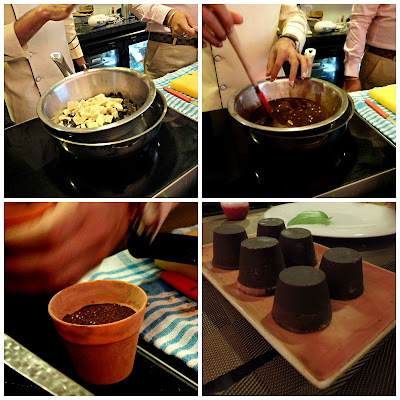 Surprisingly, this session did not need many of the special equipment and ingredients molecular gastronomy demands and whatever was used should be easy to source in Chennai. Well, in the end, all of us got an autographed copy of "India on My Platter" and a surprise goody bag from Phoenix Market City.